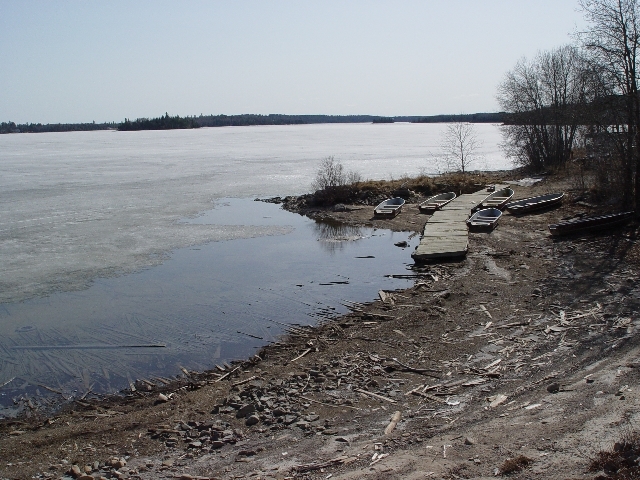 Lots of friends ask about the weather, so I thought I'd post a few pictures here from time to time to give a glimpse of the conditions around Sioux Lookout. This was taken from our deck, looking out over Pelican Lake. It's fairly dismal outside (this is a color picture). Three or four inches of snow on the ground this morning - a bit more to come. April 21 - 4 p.m.
My "ice out" prediction is May 4. April 24 - 7 a.m. Some fog rising from the ice. April 28 - 8 p.m. 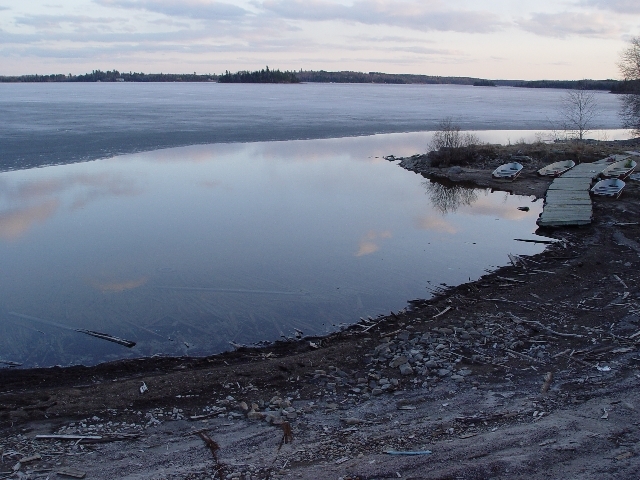 The lake level is dramatically low, though the water is rising slowly. We need rain. May 1 - 11 a.m.
My May 4 prediction for ice out is looking pretty questionable. May 3 - 8:30 p.m.
A good wind will be a big help now. May 4 - 10 a.m.
Poplar tree. First bud of the spring. A modest east wind in the last couple hours has gotten the ice moving. May 5 - 5 p.m.
Ice was gone by mid afternoon. 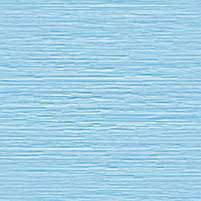 May 11 - 8 a.m.
May 21 - 4 p.m.
Windy - partly cloudy, partly sunny all day. Lake level is up a bit, but still very low. Sunny - Temps in the 20s C (70s F). 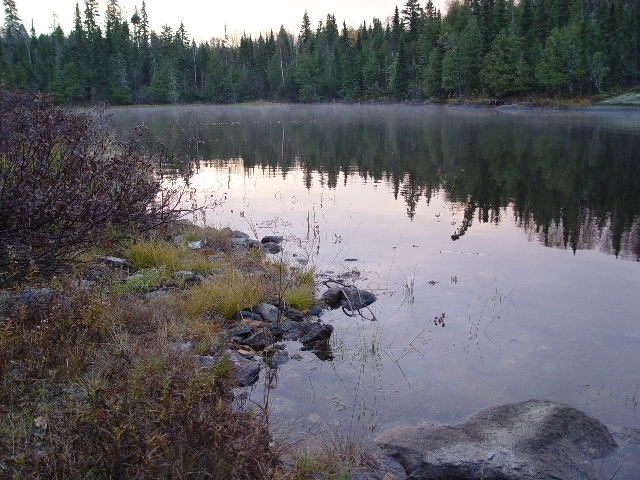 Shoreline in front of camp. This is the lowest water I can remember. July 4 - Looking out at dusk from the deck. June was especially hot and dry. Temperatures consistently hit in the mid to high 20sC (75 - 85F). Lots of forest fires. 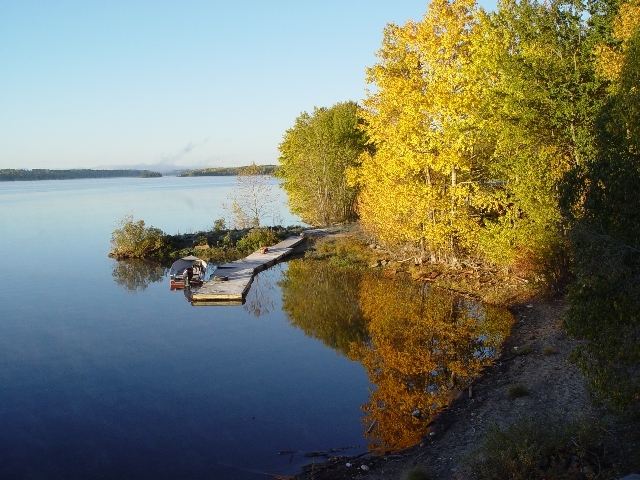 Oct. 5 - 8:00 a.m.
September rains have raised the lake water to near normal level for this time of year. This is the highest it's been all summer. We didn't get frost until last week. I think the tree leaves are hanging on later this year than usual. Oct. 13 - 7:30 a.m.
Canadian Thanksgiving. Nice weather for this time of year. A little bit of mist rising from the water at sunrise. A hint of snow and heavy fog rising from the water. Nov. 8 - 5 p.m.
Dusk from the deck at camp. Nov. 9 - 10 a.m.
A strong wind (maybe 30 mph) is about all that's keeping this stretch from freezing. Nov. 9 - 1 p.m. It took some motor work and rocking to break free from one to two inches of ice when it was time to come home. Definitely the last open-water trip to camp this year. Dec. 6 - 7:30 a.m. This is about 20 minutes before sunrise. We're having a moderate winter so far. Maybe a foot of snow on the ground. No extreme temperatures yet. 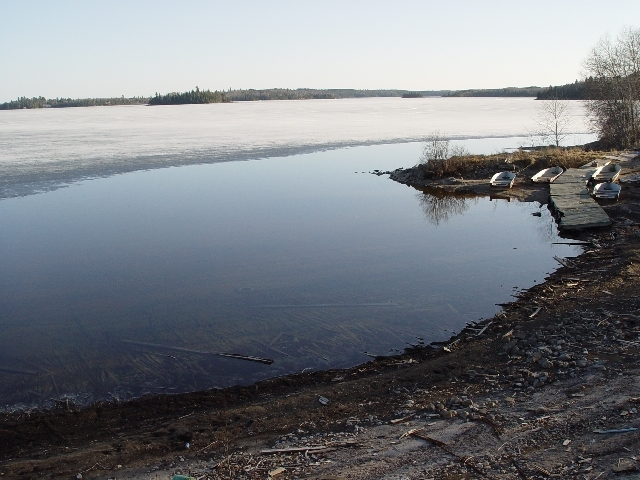 Some snowmobiles have been riding the lakes for a week. Dec. 20 - 4:15 p.m.
View from the deck at camp just a couple days shy of the shortest day of the year. Temperatures have been unusually mild for this time of year. Only about eight inches of ice. Dec. 25 - 5 p.m. Very mild and pretty day for Christmas. 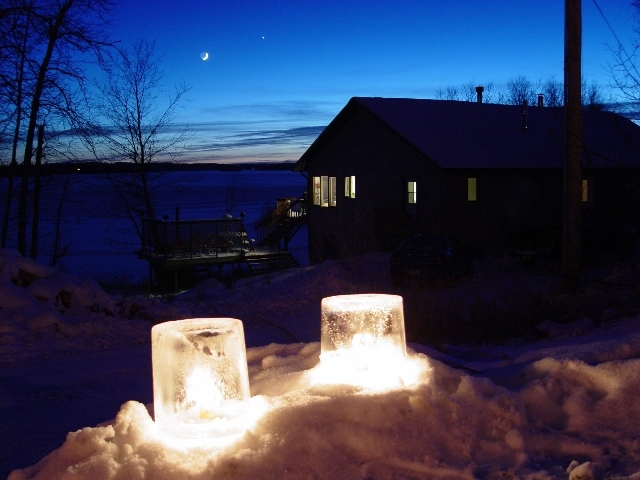 Here are some ice candles at the head of our driveway in town. Venus and the moon are noticeable in the sky.